Arab MK confronted by nationalist activists as she finally consents to AG order, questioned for incitement to violence over terror support. 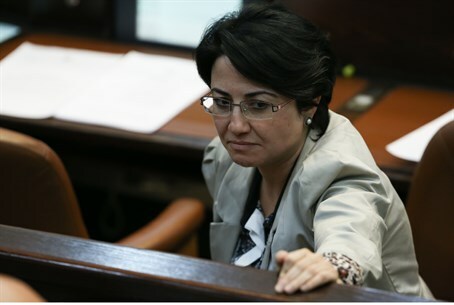 Arab MK Hanin Zoabi (Balad) arrived on Monday morning to a police station in Lod, to be investigated by the Lahav 433 unit over incitement to violence and insulting a public worker. Zoabi's arrival for investigation comes after Attorney General Yehuda Weinstein ordered her to do so last Tuesday, after she more than once refused to show up, at one point claiming she has "no time" to sit for the police investigation. Nationalist activists waving Israeli flags, led by Attorney Itamar Ben-Gvir, were waiting at the station as Zoabi pulled up in her car, at which they tried to approach her car shouting "terrorist!" only to be pushed back by police. Speaking to Arutz Sheva, Ben-Gvir said "this investigation is simply a joke, they're just lying to the whole nation of Israel." "What are they investigating her for? For insulting a public worker? For disrupting public order?" asked Ben-Gvir. "These are trivial. After all, she's an enemy member of the Knesset, a spy." Ben-Gvir elaborated his criticism of the investigation, saying "the (legal) clauses of treachery could easily be used against her, she could have been tried for inciting to violence and terror, and the Attorney General is investigating her for insulting a public worker." The attorney suggested Weinstein's investigation "was apparently only due to a lack of options and so as to silence the Israeli public opinion. This is a travesty." Weinstein's order last week included a rejection of Zoabi's request to receive in advance information about the evidence against her before showing up for investigations. The investigation over insulting a public worker comes after Zoabi early last month verbally abused two Arab police officers in a Nazareth courthouse, and even called on citizens to spit on them. Police requested to summon Zoabi to investigations at the beginning of last month over the incident, to which she responded that she was "too busy," before later using the Eid al-Fitr Muslim holiday as an excuse not to show up. MKs do not have immunity from being questioned by police, Weinstein clarified in his statement last week, only from being searched, wiretapping, detention, and immunity from criminal proceedings. Zoabi has been linked to Hamas on multiple occasions. She has said that Israel has “no right to a normal life,” and that “the Israeli occupation” was behind the murder of Israelis in Bulgaria. Recently, she declared that Israel should "thank her" for allowing Jews to live in the Jewish State. The anti-Israel MK raised a furor in June after making a series of remarks defending Hamas's horrific abduction and murder of three Israeli teenagers, Naftali Frenkel, Eyal Yifrah and Gilad Sha'ar hy''d. In the remarks, Zoabi refused to call their murderers "terrorists" and insisted that the abduction was a "legitimate" way to "fight the occupation." More recently, Zoabi published an article on Hamas's official website encouraging an Islamist uprising against Israel. She also recently was briefly handcuffed during violent pro-Palestinian protests in Haifa.